Winemakers are mostly an odd group of people. They are certainly well respected as a producer, an artist and often a farmer with vision, drive and stamina it takes to bottle the best of Mother Nature each year. We get the recognition of dancing with the weather and making decisions that will lock in the quality level of that wine years before it will ever be judged or enjoyed. Winemaking is a team sport that the winemaker is the coach and oftentimes the quarterback. It is also a chance to learn and apply new lessons each year. The harvest season is a chance to teach the next generation the process, the passion, and the pride of accomplishing the challenging feat of bringing in the harvest in future award winning fashion. Every grape variety and every vineyard section is handled separately. A batch of wine may be 1/2 ton for one barrel or many tons to fill hundreds of barrels. At Fabbioli, we will have about 30 different “lots” of grapes coming in. Each of these will go through the process separately and later blended together. We now have a cold room where we can store grapes overnight for processing the next day. This can buy us time if the grapes come in faster than we can handle. 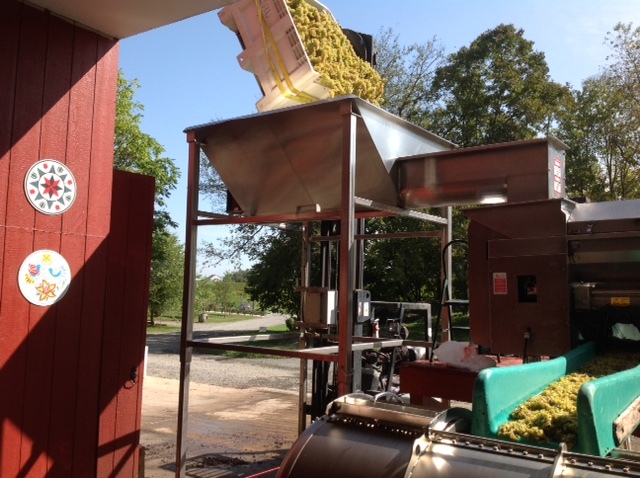 Some grapes will be “whole cluster pressed” giving a brighter character to the wine. This optional processing style will take more press loads to process the fruit because the whole cluster grapes take up lots of space in the press. Each press cycle can take up to 4 hours between loading pressing and emptying. As the grapes ripen, the winemaker schedules up receiving of the fruit and handles that fruit according to the plan that was built in the months prior to harvest. I liken it to a busy night at a fine dining restaurant. Each party of diners is greeted, seated and served. It takes planning, focus, attention and commitment so all comes out well. Each batch of wine needs attention to make the best wine for where it is destined. Acid adjustments, cold settling, different yeasts, barrel fermentation, skin soaking, co- fermentation with other grapes or skins, tannin or oak chip additions and any combination are some of the tools of the winemaker for the early stages. As much as winemakers would like the grapes to make reservations for their time slot, the condition of the fruit, weather conditions, and picking team availability can adjust a plan adding more pressure on to the winemaker’s shoulders. The winemaker knows that this first process of the grapes can make or break the wine that it turns into so quickly. Thoughtful adjustments will keep those wines on a sound path for quality. Sometimes long days get longer, the days off disappear, and family time slips away as the grapes take the priority. Winemakers and their teams understand this push. It may be very intense for a period of time, but we know the season will end as there are only so many grapes. We each have a bit of a bond through this process. The crush pad operates like a NASCAR pit stop many times. The press is the race car and our jobs are to keep that working all the time. When a pressing cycle is finished, the dried skins are emptied, the next batch is loaded and the 2 hour pressing cycle begins again. Setting the tone with the new workers is critical to the success of the pit crew. Forklifts, pallet jacks, crusher, slide, bins, pumps and tanks all need to be used to make this turn as efficiently as possible. Being efficient adds to our quality by getting the juice in the best place as soon as we can. So plan as best you can, teach and respect the “sense of urgency” in handling the fruit, and be as flexible as possible. Mother Nature does not hand you a perfect season very often. Your reputation, team and business rely on the ability to make quality wines year after year. It all comes down to the crush.